You'll be impressed with the outstanding quality of these beauties! Perfectly round and unblemished white freshwater cultured pearls shimmer like moonlight on winter snow and complement every outfit in your wardrobe. 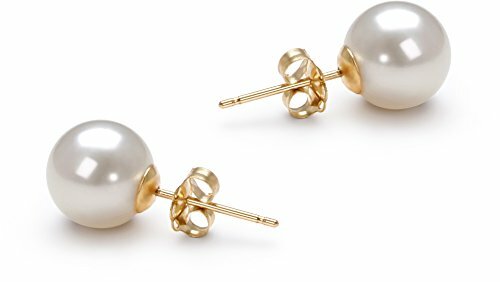 Wear these cultured pearl earrings with brightly-colored blouses and shirts so they reflect your style back to the world. This earring set showcases 7 to 8mm white freshwater cultured pearls and is an overall AAAA quality - combining amazing mirror-like AAAA luster, perfect (and very rare) AAAA shape and AAAA body. Your earring set will be carefully packed and shipped to you in an elegant jewelry box and accompanied by lots of free extras. And, if you choose, we would be delighted to gift wrap your earring set and turn this earring set into an unforgettable gift.